The internet of today is competitive, and having a strong local SEO strategy is a necessity for small businesses. Most business owners know the difficulty of remaining competitive online, but they don’t know where to start. Small businesses owners should consider these local SEO optimization tips. Google rolled out their latest update in September 2016, and it encourages business owners to provide a more useful, relevant experience for searchers. The Penguin update lists a few strategies that can help business owners push their sites to the top of local rankings. Some factors revealed in the Penguin update include domain authority, on-page optimization, and the physical address of businesses. Another effective strategy is to build local listing pages on directories such as Google+, Yelp, and Foursquare (just to name a few). Business owners should create profiles on these directory sites and claim site ownership. From there, the owner should ensure the accuracy and consistency of the listings. By listing the website on these directories, business owners can rise through local listings. By signing up for Google’s My Business, a local business owner can make his or her site more visible on Google+, Search, Maps, and Google Local. When the site owner signs into this service, they can enter or update the business’ address and contact information, and they can also access other apps such as Reviews, Insights, Analytics, and Hangouts. The business search service can be accessed via desktop browser or mobile app, and the app provides notifications when someone reviews the site on Google+. Putting a blog page on the company website will help the owner improve the site’s visibility. The more posts you publish, the more visitors will come to the site. Writing blog posts allows business owners to target locally-relevant search terms and keywords, and these posts can keep visitors on the site once they’re there. The longer a visitor stays on the site, the more likely they are to turn into a customer. Relevant, engaging blog content reduces bounce rates, which are an important measurement of the site’s search engine ranking. Optimizing a site for mobile users is another important way to improve its search engine rankings. With each Google algorithm update, mobile optimization becomes more important. Updates prioritize sites that display well on smartphones, tablets, and other mobile devices, and these sites rank higher in mobile search results. Google gives great importance to online reviews during site rankings. Good reviews build trust in a site and enhance credibility, and that’s why it is important for business owners to gather positive reviews from customers. Owners can increase the likelihood of customer endorsement with emails listing all the major review sites such as Google Places and asking for their input on products and services. With each algorithm update, it becomes increasingly important to have site content that offers users something of value. It’s quite easy to create engaging, valuable site content. All the business owner has to do is determine customers’ concerns and write content that attempts to resolve them. By solving a reader’s specific problem, a business owner can enrich that customer’s online experience. Building a solid presence on sites like LinkedIn, Pinterest, and Twitter is critical for a business owner who wants high search engine rankings. Social media also has indirect effects on site rankings. When a company’s fan base increases, more people visit the site. Search engines take site popularity cues from search results, and increased traffic can boost the site’s rankings. Business owners should focus on an improved user experience (UX) by making sites easy to navigate. Clear layouts, appealing designs, and easy-to-find contact info can go a long way toward a better UX, and these factors can encourage visitors to remain on the site longer. When visitors stick around, conversion and bounce rates improve, and it boosts the site’s search engine ranking. To dominate search rankings, site owners should regularly update site content. This helps sites in two main ways. First, regular updates keep customers coming back to see what’s new. Second, Google’s algorithm updates tend to favor sites that frequently post new content. 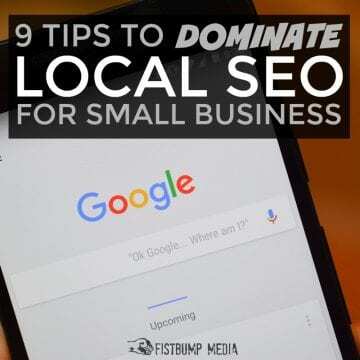 By following the tips listed here, business owners can improve their local SEO. P.S. Learn more about our search engine optimization (SEO) services, and drive more traffic to your site. I like that you mention to optimize your site for mobile devices. I think that is so important nowadays since everyone just uses their phones like crazy. If I were a business owner that was looking for small business seo strategy services, I would definitely be interested in getting my website to work on phones. Yep. That’s a big one. And not just for SEO purposes, but also for user experience purposes (which is why it has impact on SEO).